In the blink of an eye and in only the time takes to pan cook Italian sausages you can have a deliciously easy Italian Sausage Caprese Sandwich for dinner tonight! 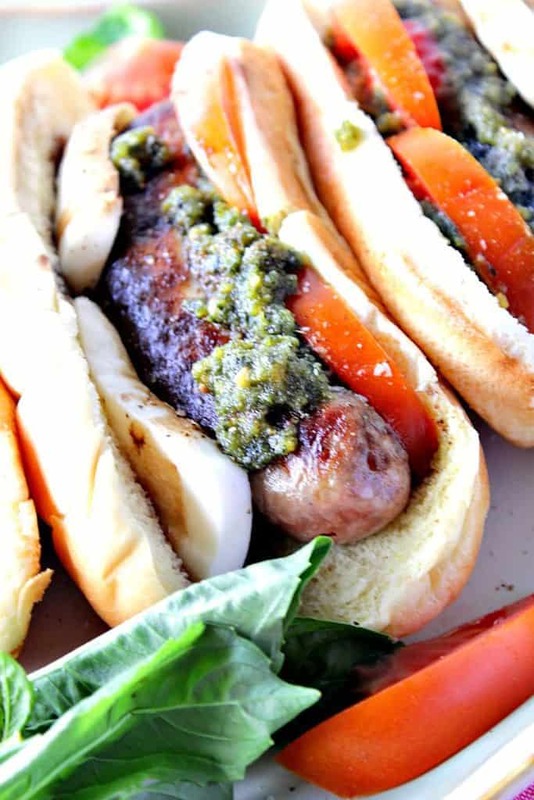 Using homemade (or store bought) basil pesto and the last of summer’s fresh tomatoes makes these Italian Sausage Caprese Sandwiches the perfect easy weeknight or weekend dinner when time is tight, and you don’t feel like cooking. 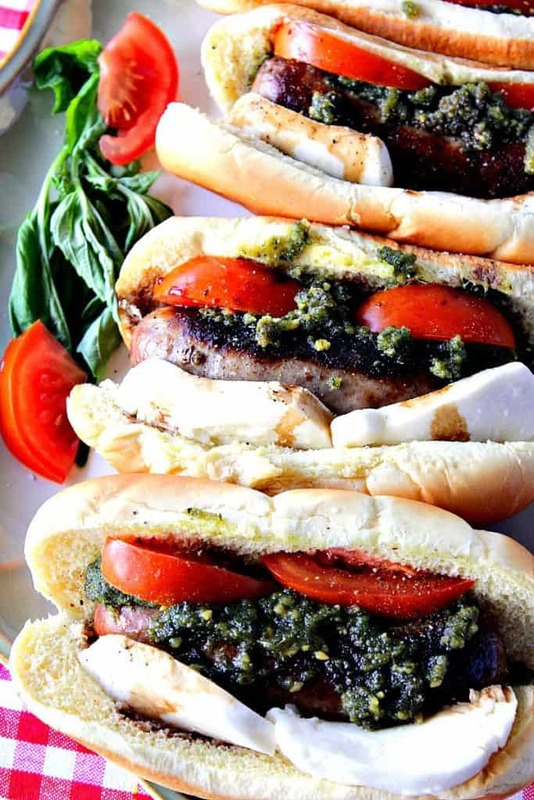 **Please Note – The printable recipe card with detailed instructions and complete ingredient measurements for making Italian Sausage Caprese Sandwich is available near the end of this post. Since we live in the Midwest, my husband and I are all about sausages. He’s partial to Italian sausage, and I’m partial to bratwurst. I can easily eat a sausage without a bun to keep the carb level low, but he’s all about a bread and meat combo. 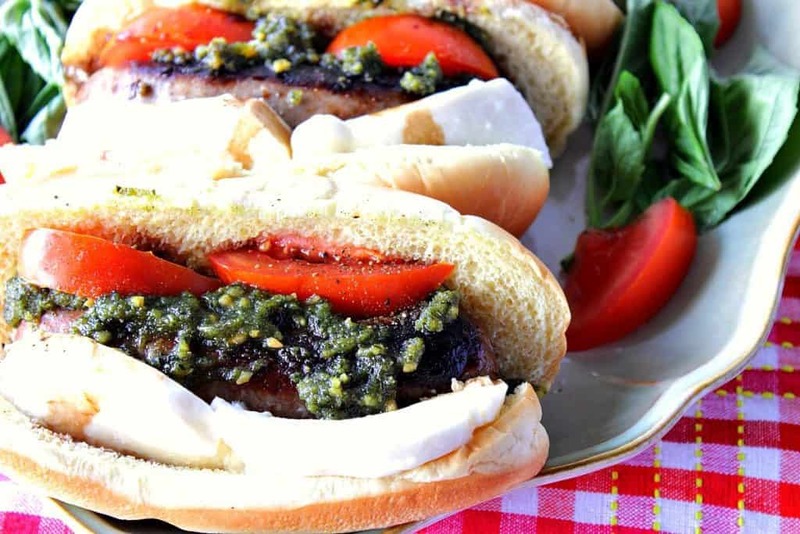 This Italian sausage Caprese Sandwich is one my hubby gave a hearty two thumbs up to, and it’s one he loved taking to work the next day for lunch. He’s one lucky guy, that’s for sure! 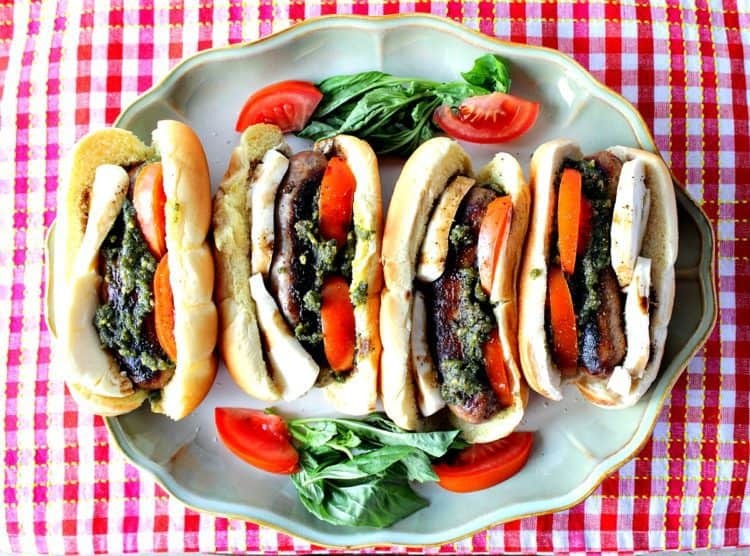 I did not make my own basil pesto for these Italian Sausage Caprese Sandwiches. I used store-bought. I did try and grow basil this summer out on our back deck, but it really didn’t do well for me this year. The same goes for the tomatoes I tried to grow. No luck. The plants I had in deck planters bared hardly any fruit, and what they did supply stayed small and virtually tasteless. Very dismal indeed. All I can say is thank goodness to our local farmers and farmer’s market for quality produce, and the wonderful selection of sweet and juicy late-season tomatoes. If you’re lucky enough to have fresh basil to turn into pesto, there are tons of basil pesto recipes on the web. A favorite of mine I’ve used in the past is from Sally’s Baking Addiction, How to Make Homemade Basil Pesto. I did my best to produce the following fun and fast-paced video of the making of American Flag Heart Decorated Sugar Cookies. I hope you’ll find it entertaining and helpful. If you enjoy this video, please don’t forget to subscribe to my Kudos Kitchen channel on YouTube. Thanks so much!! Since we’re talking sausage, here are a few other sausage recipes I’ve shared over the years that I think you’ll also enjoy. They’re some of my absolute favorites! Love, Love, Love!! I just can’t get enough! Add the oil to a large skillet and heat over medium/high heat for 1-2 minutes. Add the sausage to the skillet and brown on all sides. Cover the skillet, reduce the heat to medium and cook the sausage turning occasionally until the sausages are cooked through and are no longer pink. Approximately 15 minutes. 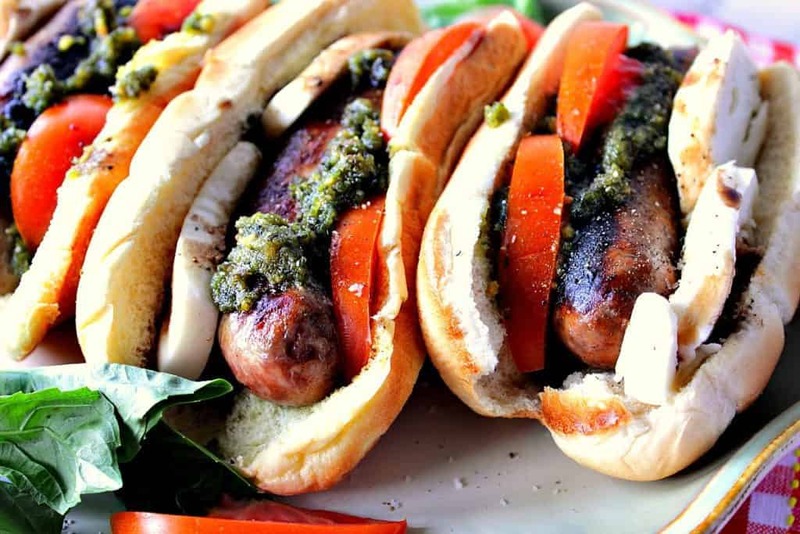 Place each sausage on a bun, add pesto, mozzarella and tomato slices and drizzle each with approximately 1 teaspoon of balsamic vinegar. Season sparingly with salt and pepper and serve. 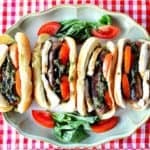 I sincerely hope you’ve enjoyed this Italian Sausage Caprese Sandwich recipe as much as I’ve enjoyed bringing it to you. Should you have any comments or questions for me, please don’t hesitate to contact me directly or leave me a comment in the comment section. I’m always happy to help answer any questions you may have.